In recent times, the internet has helped many budding entrepreneurs to use this platform to sell their products and build a good, stable online business. Hiked graphs can be seen in online sales, and business owners are increasingly becoming aware of the growing significance of digital marketing. It is essential to plan a strategy and implement it flawlessly to get excellent results. With a lot of global marketplaces available, these days like WooCommerce, eBay, Magento, Amazon and more, the sellers have a lot of avenues open for them. They can make the most of them set up their online business. Many eCommerce enthusiasts are using WooCommerce platform to kickstart their business. They can also go for WooCommerce eBay integration that enables the sellers to upload and sell products on both WooCommerce and eBay platforms. Using a sophisticated integration tool, it becomes easier to integrate the inventory, price, order and many other relevant details about the product in an effortless manner. The same holds true for Magento Amazon and Magento eBay Extension that helps Magento store owners to upload product from Magento to Amazon and eBay platforms. 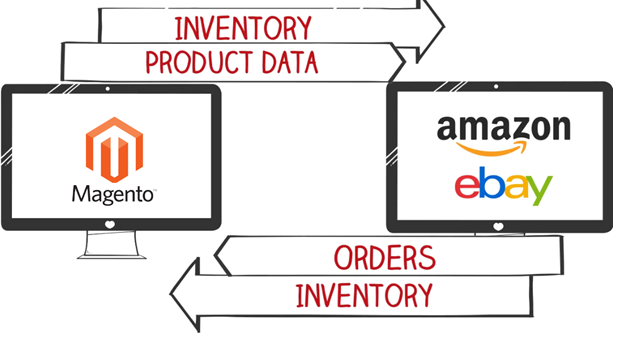 The admin can also easily import orders from Amazon and eBay marketplace to Magento converting them into regular Magento orders. The hassle-free upload of products has made things easier for the first-time sellers. The bulk management system is also used when handling the sale of bulk products. The sophisticated and state-of-the-art software solutions have helped many online merchants make the most of global online marketplaces. This entry was posted in magento amazon, Magento eBay and tagged Magento Amazon, Magento eBay extension, WooCommerce eBay on January 31, 2019 by Steve_Burns.